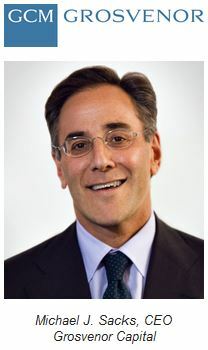 CHICAGO (January 15, 2015) – Illinois-based Grosvenor Capital Management and its Chief Executive Officer Michael J. Sacks will receive the 2015 Equality Illinois Business Leadership Award for the prominent role played in spearheading business support in the fight for marriage equality. “When we filed our marriage bill two years ago, only nine states had marriage equality and our hill seemed much steeper to climb. Michael Sacks understood the critical role that business leaders could play in advancing the historic legislation and became one of the first signatories to the open letter from leading Illinois companies and civic leaders imploring the General Assembly to pass the bill. He also worked to recruit other prominent names for the letter from the business world,” Bernard Cherkasov, CEO of Equality Illinois, said when announcing the recognition on Thursday. With marriage equality in effect less than one year, the 2015 Equality Illinois Gala will be held on Valentine’s Day and celebrate the first year of equal love in Illinois under the theme of “love is love is love.” The Equality Illinois Business Leadership Award will be presented at the gala on February 14, 2015 in the Hilton Chicago. The gala is annually the largest LGBT event of its kind in the Midwest. Grosvenor Capital Management is a leader in the alternative investment industry, specializing in public and private markets solutions that span hedge funds, private equity, infrastructure and real estate. Grosvenor currently manages over $47 billion for a globally diverse client base. The Equality Illinois Business Leadership Award is given annually to firms that demonstrate remarkable vision, courage, and leadership in the effort to achieve full equality for LGBT individuals in Illinois. Past Business Leadership Award recipients include State Farm Insurance, United Airlines, AT&T, Kraft, Walgreens, Motorola, and McDermott Will & Emery. It was previously announced that the recipient of the 2015 Equality Illinois Freedom Award at the gala will be the TransLife Center of Chicago House. More details about special guests and gala honorees will be announced in the weeks ahead.